Head of School Ellen Stein kicked off the day to a packed house in the Martin Theatre. She concluded her welcome by saying, "Whether we call ourselves administrators, teachers, or even Heads of Schools, maybe our most important job of all is to inspire and to celebrate the ripple effect of empathy. To understand each other. To recognize the individual in our community. To show gratitude for all –– those who read to us, teach us, protect us, feed us. Our job is to listen. To learn. To create something positive." 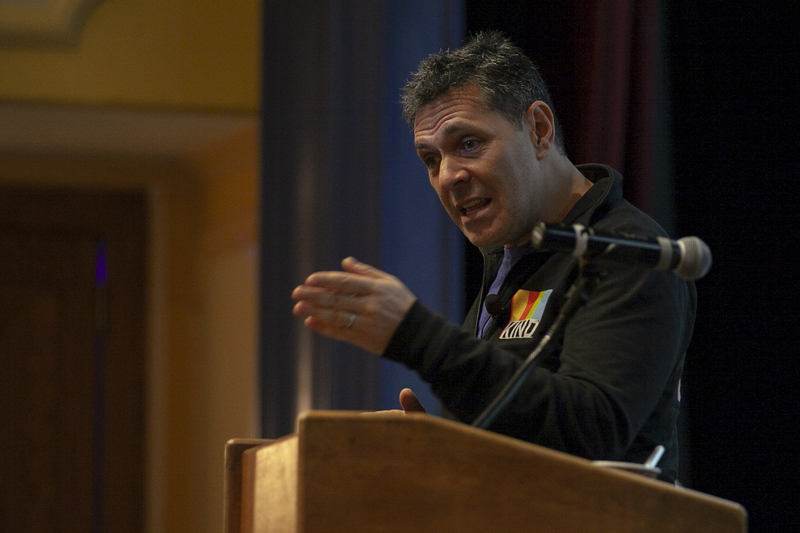 Dalton parent and KIND CEO Daniel Lubetzky was the conference keynote speaker. His mission is to make the world a little kinder, one snack and kind act at a time, with a goal for creating positive social change. Both the KIND Movement and KIND Foundation work to build more empathetic communities. Daniel’s keynote highlighted the difference between being NICE and being KIND. Being nice allows for being passive. Being kind requires caring enough to confront and take action. His words resonated and confirmed that we need to make more of an effort to be kind to each other and not accept the unkind rhetoric and behavior that is becoming more prevalent. The rest of the morning was spent with constituent groups discussing how to encourage our school communities to become more empathetic and take action where needed. After lunch the students attending presented their schools from their perspective offering clear ideas about how to move forward. The balance of the afternoon provides the opportunity for each school to meet separately to discuss what they've learned during the day and to create action plans to bring change back to school. From the buzz at the reception at the end of the day, the PODs were very busy talking, agreeing, disagreeing, and planning. The energy in the building was palpable! Thank you to over 65 Dalton volunteers and especially the Planning Committee: Casper Caldarola ‘77, Rena Andoh ’93, Bee Animashaun, Josh Bachrach, Michele Barakett, Kathy Chan, Roxanne Hsu Feldman, Amy Hikida, Emily Kasof, Eri Noguchi, Claire Riccardi, Natalie Sanchez, Ashley Smyth, Monique Vogelsang, and Lisa Waller.